1200ml bottle, imported from Japan. 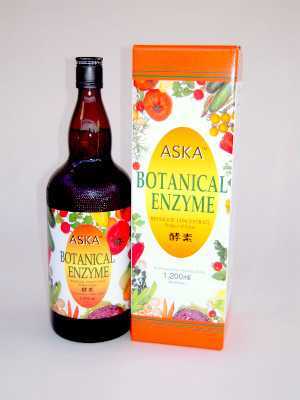 ASKA BOTANICAL ENZYME is called a"Nutritional Botanical Enzyme Complex Drink". Proteins that are broken down to amino acid, as well as minerals, vitamins are well blended in, with no fat contents. The product is 100% natual. The sweetness comes from the glucose and fructose, and since these are simple sugars, it won't stay and accumulate in the blood but is converted into an energy which would sustain the body strength. Why use 60 different types of fruit, vegetables and seaweeds? Plants have enzymes that are unique to each kind. By fermenting various plants together will produce enriched enzyme. The enzyme itself is not a living cell, however, every living cell contains enzyme and simply put, without enzymes, life would not exist. There are so many different types of enzymes, and each plays a unique role of carrying out a certain biomechanics of an organism. This explains that some estimate hundreds and thousands of different kind of enzymes that exist, and this is the reason ASKA BOTANICAL ENZYME uses so many variety of plants to have wide variety of enzymes. The enzyme taken works as a catalyst to boost internal enzymes that already exists. These rejuvenated enzymes start activating, thus gives metabolism a boost. The end result is better gastrointestinal, hepatic, renal and other organ functions, lower blood pressure, and a solution to constipation. Strong metabolism, in turn contributes to better body condition as a whole. 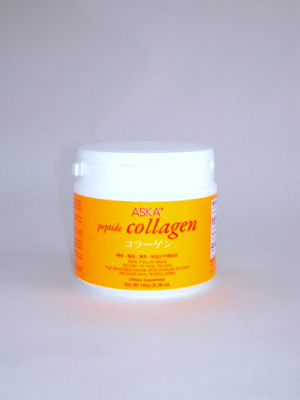 As a dietary supplement, mix the concentration of the Enzyme (1/2 cup* -25ml) with water or natural juice. Hot water slows down the functions of the enzyme so it is not recommended for a use. (Room temperature is ok to use.) It is best absorbed in the morning, before bed at night with empty stomach. *Small cup is supplied with the product.